Black Friday "addict" Qiana Roberts, left, convinced her niece Najla Roberts and friend Qian Boone to stand in line for hours at a Philadelphia Target. Qiana Roberts admits she has a Black Friday addiction. She skipped Thanksgiving with her family in order to get a spot in line outside a Philadelphia Target (TGT) at 8 a.m. Thursday -- 12 hours before it opened. By the time she got there, she was about 12th in line. "It's hard for me not to go, even when I don't really need anything," said Roberts, who has waited in line at either Target or Wal-Mart (WMT) for seven Black Fridays straight. "Guess, I'm a little addicted." 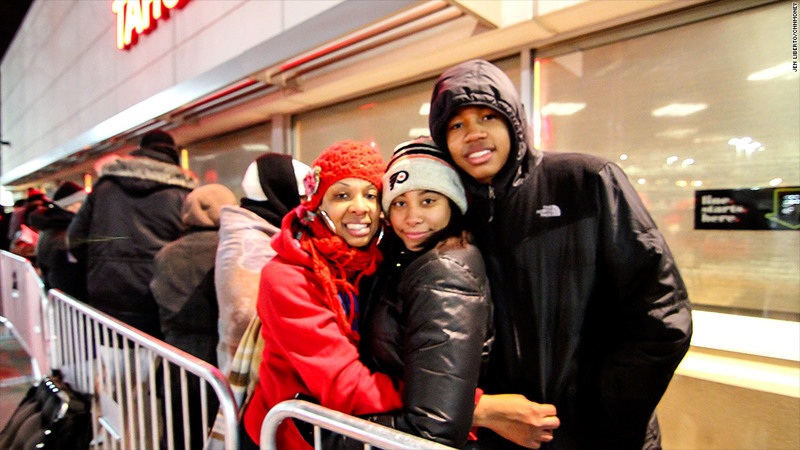 By 7:30 p.m., some 200 people were braving the cold in hopes of nabbing Black Friday deals at the Target in West Philadelphia. Related: Braving Black Friday? Send us your experiences. Most of the people in line said they wanted the "doorbuster" sale item -- a 50-inch Element TV for $229 that usually sells for $600 -- available by ticket to the first 50 people in line. The other big sale item was Beats By Dre headphones on sale for $115, normally $179. Roberts, 35, was desperate to get three TVs, so she enticed niece Najla Roberts and friend Qian Boone to come along. "But I would have gone alone. I've done it before," said Roberts who works for the Philadelphia school system. 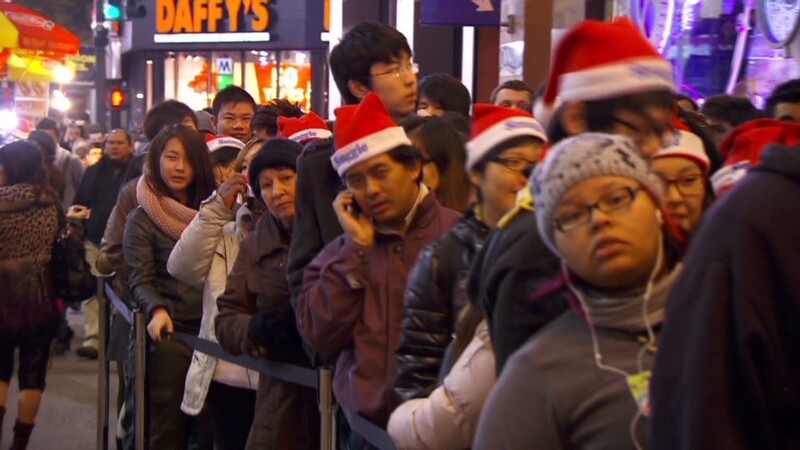 Target is one of a handful of stores that kicked off Black Friday earlier on Thanksgiving Day this year. But its 8 p.m. opening was still as much as three hours later than the store openings at Toys "R" Us, Best Buy (BBY) and Wal-Mart. Poll: Will you shop or not? Shoppers didn't seem too irked by the earlier opening. Indeed, Rick Dengelegi, who oversees 9 Philadelphia-area Target stores, said lines were longer, even earlier than last year. "Some guests may have already shopped (elsewhere) and then come here, but we're definitely seeing a bigger line, which is exciting," Dengelegi said. First in line was Khalif Robinson, who got to the West Philadelphia Target at 12:45 a.m. Thursday morning to ensure he got a deal on the 50-inch TV to better enjoy the Philadelphia Eagles football games. Robinson mistakenly got in line that early because he thought Target opened at 8 a.m. Other shoppers didn't arrive until 3 a.m. Robinson wore a warm Eagles jacket, but his toes had gone numb by Thursday evening -- and he was starving, because he hadn't eaten all day. "I'm going to eat seven plates of glory (Thanksgiving feast) when I get home," said Robinson, with a couple of hops to stay warm. Related: Is Black Friday Worth It? For Darlene Robinson (no relation to Khalif), waiting in line for the 50-inch TV was a mission of love. Robinson is the housing coordinator for Women Walking in Victory, a Philadelphia nonprofit about to open a new 16-bed home for poor women with mental health problems. The television was for the 15 women checking in to the new facility on Friday. "Some of them really have nowhere to turn, so I'm here for the people," said Robinson who got in line around 4 p.m. "It's worth the wait."